MARIGOT–Despite a plea to the union from the Collectivité to allow access to Central Kitchen staff, access to the facility on the Grand Case bypass was again blocked by strikers from 6:00am Monday, forcing Gendarmes to physically move protestors, obstructions and belongings from the main RN7 road where many had camped overnight, and reopen access to the kitchen. Video clips posted on social media showed protestors lying on the road crying, and occasional scuffles and confrontations with Gendarmes. Despite Gendarmes intervening to reopen access, no employees of the kitchen turned up for work, reportedly not willing to work under the tense circumstances. 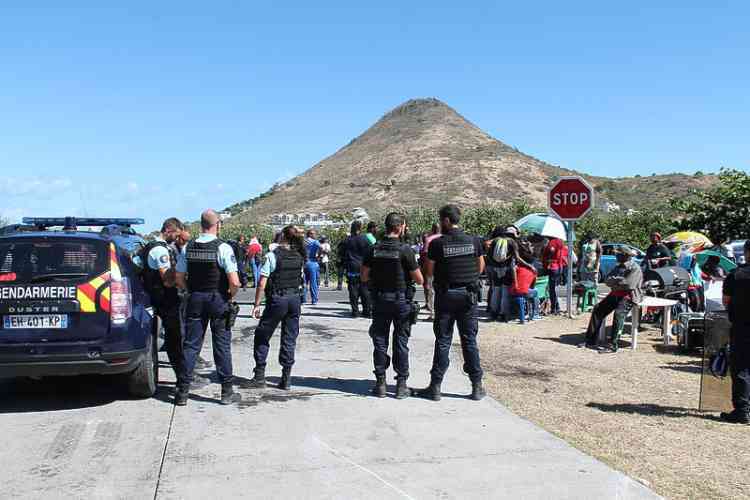 “We’ve been protesting peacefully and now they put law enforcement on us this morning, who pushed us around, throwing us into the bushes, throwing away our stuff,” complained UTC/UGTG union spokesperson Nicole Javois about the Gendarmes’ actions. “They really manhandled us and most of us are women. It’s a shame. We have employees without a job, they have no revenue, our careers are not moving, the afterschool activities situation is terrible, we are still asking for our bonus. Despite the disturbances, Javois said the union is still going into the reopened negotiations with the Collectivité starting this morning, Tuesday. Gendarmerie Lt. Colonel Sebastien Manzoni said no unnecessary force had been used by Gendarmes. The strikers had requested the presence of elected officials, and First Vice-President Valérie Damaseau and a delegation complied with that request. Discussions on site with the strikers and elected representatives did not appear to improve the situation. A meeting had been held in French Quarter on Saturday, at the request of strikers, to answer questions and explain the situation. Damaseau convened a press conference Monday afternoon to update the media. “This situation is harmful for everyone and, above all, harmful for parents and children who have to deal with the daily lack of working canteens and lack of afterschool activities,” she said. In the absence of the Central Kitchen, the Collectivité has arranged for some 3,700 sandwich lunches to be served to students today. A cold meal will be served until the Central Kitchen returns to normal operation. The Collectivité estimates 60 employees of Caisse Territorial des Oeuvres Scolaire (CTOS) out of 220 are on strike and 70 out of 875 of the Collectivité. Regarding the union’s claim that there are 83 vacancies at the Collectivité waiting to be filled, Damaseau explained that is not strictly true.